Last year, Donna Criner’s charity received an email informing her organization it had been selected to give a brief presentation about its mission for a chance to win a cash donation. Immediately Criner thought the email was a scam but, after doing some research, she discovered the contact from a recently formed Region-based group of philanthropists called Impact Club Tri Town was legitimate. 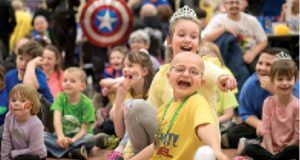 “From what we were able to learn, it turned out (Impact Club Tri Town) was actually part of a national club (of) business people, entrepreneurs who simply want to make a difference in their communities,” said Criner, executive director of Northwest Indiana Cancer Kids Foundation Inc. of St. John. In September, Criner and representatives from ABRA Inc. and Food Bank of Northwest Indiana gave five-minute presentations to Impact Club Tri Town. At the end of the program, Criner was informed her organization had been selected by club members to receive a $4,600 donation. Mark Borst, founder and host of Ask NWI, co-founded Impact Club Tri Town in St. John, which launched in November 2017. Borst said the idea for Impact Club emerged from conversations he had with members of a business networking and idea group with whom he is in regular contact. The idea became Impact Club, whose first chapter formed in northern Virginia in December 2016. There were 16 active Impact Clubs around the country through early October, and its likely more chapters will form, Borst said. Joining Impact Club is simple. A member commits to donating $100 every three months to the club. All donations are pooled together and members each nominate three organizations. Three of them are drawn at random and then contacted and invited to speak to club members. Impact Club Tri Town had 46 members through early October, but Borst hopes to grow that number. All donations from club members are given to the selected charity. “The more members, the bigger the donations are to charity,” Borst said. Mary Martinez, co-founder of Hannah’s Hope in Portage, was the first organization to receive a donation from Impact Club Tri Town. Martinez said Impact Club’s format also allowed donors to learn about other local charities that they might not be aware of that also are doing good in the community. Borst said long-term plans for Impact Club Tri Town are to create a space on its website where information on all the charities who presented to his club can be found.